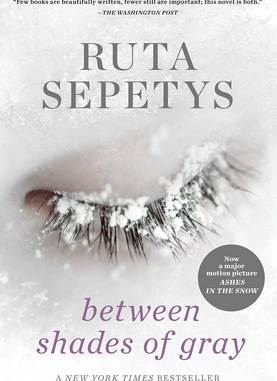 The historical novel Between Shades of Gray by Ruta Sepetys, author of Salt to the Sea. The novel Between Shades Of Gray by Ruta Sepetys is an emotional and heartbreaking story of a girl and her family trying to survive the brutal repression and forced labor perpetrated by Josef Stalin and his officers during World War II. Many Canterbury students are already familiar with the author Sepetys from reading Salt to the Sea. In the summer of 1941, 15-year-old Lina, her younger brother, Jonas, and their mother, Elena, are abruptly forced from their Lithuanian home by the Soviets and deported to a Siberian labor camp. Their father has already been arrested and sent to prison for treason. The Vilkas’ are taken to a train station where officers of the secret police attempt to separate the family. People were herded onto the trains like cattle and packed so tightly there was little room to move or even breath. The train car was labeled “Thieves and Prostitutes”. The long train journey is horrifying, and there’s little comfort upon arrival: violence and death stalk the prisoners. Lina begins to build a friendship, and then a romance, with Andrius, a fellow prisoner. A talented artist, Lina records her experience in drawings, kept hidden from the cruel guards, and buries them in a jar hoping that her testimony will eventually see the light of day, as she struggles to keep her faith in humanity and her hope for any future. Lithuania, Latvia, and Estonia all disappeared from the map in 1940 and did not reappear until the collapse of the Soviet Union in 1990, when the survivors of the work camps were finally allowed home, though most had perished. The permanent, threatening presence of the KGB ensured that their stories could not be told, until now. The horrors Sepetys describes are staggering, but it’s an effective and sensitive way to bring history to life. This book is an absolute must-read for all students. The reader will gain so much knowledge on the topic of Stalin’s mass genocide, which is widely unknown. When most people think of mass genocide, they typically think of Hitler and the Holocaust. But most people don’t know that Stalin persecuted nearly five times as many people during his reign in the Baltic region. The stories of these survivors have been hidden from the world because they were threatened with death and violence if they shared them. I have read this book three times and haven’t gotten tired of it. The wild adventure that Lina has taken on is so intriguing that each time I read it I discover something new about her character. I highly recommend this book to anyone who enjoys learning about history, enjoys reading historical fiction, or simply anyone with an open mind looking for a new book. Between Shades Of Gray receives five stars in my book.